Following my recent post about the importance of opportunities for Catholic choristers, a number of readers have been in touch to ask for information about Children's Choirs. I have therefore reproduced below a list which was published on NLM in 2013. 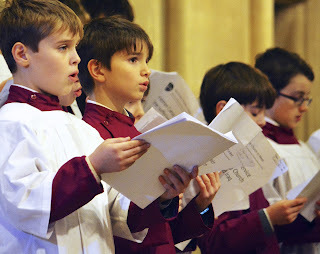 If you wish to add any other similar liturgical choirs, specifically for Catholic Children, or update the details already provided, please do so in the comments below. It is particularly wonderful to hear that St Francis of Assisi, Pottery Lane, London, is founding a Junior Choir and is advertising for a Director. This is a beautiful church, designed by John Francis Bentley, and the Parish Priest is himself a very accomplished organist. This is an excellent opportunity and it is fantastic to see such an investment being made. Details of the position are available here.